Marie Duplessis (15 January 1824 – 3 February 1847) was a French courtesan and mistress to a number of prominent and wealthy men. She was the inspiration for Marguerite Gautier, the main character of La Dame aux Camélias by Alexandre Dumas the younger, one of Duplessis' lovers. Much of what is known about her has been derived from the literary persona and contemporary legends. Marie Duplessis was born Alphonsine Rose Plessis in 1824 to Marin Plessis and Marie Plessis (née Deshayes) at Nonant-le-Pin, Normandy, France. At the age of 15, she moved to Paris, where she found work in a dress shop. As recorded in art of the day Marie Duplessis was evidently an extremely attractive young woman, with a petite figure and an enchanting smile. By the time she was 16, she had become aware that prominent men were willing to give her money in exchange for her company in both private and social settings. She became a courtesan and learned to read and write, and to stay abreast of world events so as to be able to converse on these topics with her clients and at social functions. She also added the faux noble "Du" to her name. Duplessis was both a popular courtesan and the hostess of a salon, where politicians, writers, and artists gathered for stimulating conversation and socializing. She rode in the Bois de Boulogne and attended opera performances. She also had her portrait painted by Édouard Viénot. 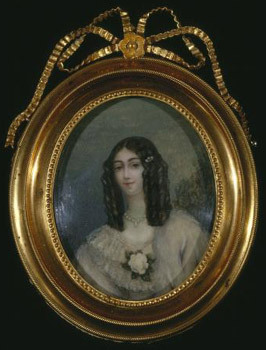 Duplessis was the mistress of Alexandre Dumas fils, between September 1844 and August 1845. Afterwards, she is believed to have become the mistress of composer Franz Liszt, who reportedly wished to live with her. In her short life, she gained a reputation as a discreet, intelligent, and witty lover. She remained in the good graces of many of her benefactors even after her relationships with them had ended. She was briefly married to at least one of her lovers: a French nobleman, Count Édouard de Perregaux. Marie Duplessis died of tuberculosis at the age of 23 on 3 February 1847. Her husband, the comte de Perregaux, and her former lover, the Baltic-German count Gustav Ernst von Stackelberg, were by her side. Within a few weeks of her death, her belongings were auctioned off to pay her debts. Her funeral in Montmartre Cemetery in Paris was attended by hundreds of people. Dumas' romantic novel La Dame aux Camélias was based on Duplessis. It appeared within a year of her death. In the book, Dumas became "Armand Duval" and Duplessis "Marguerite Gautier". Dumas also adapted his story as a play, which inspired Giuseppe Verdi's opera La traviata and various films. The journalist Romain Vienne was a childhood friend of hers and wrote La Verite sur la dame aux camélias to correct some of the fictions that had grown up around her. Wikimedia Commons has media related to Marie Duplessis. ^ a b c d e Gardner, Lyn (5 March 2003). "The reality behind the myth of Camille". the Guardian. Retrieved 24 March 2018. ^ a b c d e Predota, Georg (24 October 2012). "Redemption through Consumption!Liszt and Marie Duplessis : Interlude.hk". Interlude. Retrieved 24 March 2018. ^ Weber, Caroline (19 July 2013). "'The Girl Who Loved Camellias,' by Julie Kavanagh". The New York Times. Retrieved 24 March 2018. ^ "Portrait of Marie Duplessis". Retrieved 2013-01-20. ^ a b "La Dame aux Camelias: The Tragedy of Marie Duplessis". Persephone Magazine. Retrieved 24 March 2018. ^ Weis, Rene (15 January 2016). "The Real Traviata: The tragic true story that inspired La traviata". Royal Opera House. Retrieved 24 March 2018. ^ "The Gacé girl who became a Paris queen; La Dame aux Camélias". Normandy Then and Now. 2 July 2016. Retrieved 24 March 2018. This page was last edited on 26 March 2019, at 19:43 (UTC).